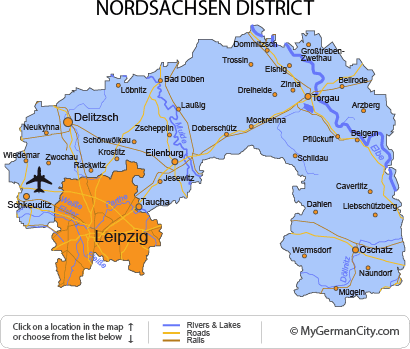 The most northerly district in Saxony state is the Nordsachsen District, bordering on both Brandenburg and Saxony-Anhalt. It has the dynamic city of Leipzig as its neighbor and sits on the low plains which cover the area. Frederick the Great of Russia had a home here — Dahlen Castle — in the medieval town of the same name. This whole area is surrounded by forest and is great for walking or cycling. The Hubertsburg Palace is another enormous building just outside of Wersdorf. On the Elbe, the capital of Torgau is rich in architecture and has a memorable historic town center that you just don’t want to miss. This is also the town where Russian and U.S forces met towards the end of World War II — a plaque marks the spot.